The world’s biggest maker of mobile phone chips has been fined €997m ($1.2bn; £870m) by European authorities for paying Apple to use its chips. 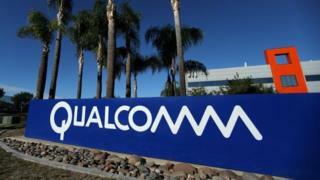 The EU’s Competition Commission said Qualcomm had “prevented rivals from competing in the market”. Qualcomm said it would appeal against the fine. Competition Commissioner Margrethe Vestager said Qualcomm had “illegally shut out rivals” from the market for more than five years. She said that Qualcomm had paid billions of dollars so that Apple would exclusively use its technology in iPhones and iPads. As a result, no rival could challenge Qualcomm in this market, “no matter how good their products were”, she added. Ms Vestager said Qualcomm’s behaviour “denied consumers and other companies more choice and innovation”. In a statement Qualcomm said it strongly disagreed with the decision and would immediately appeal against it to the General Court of the European Union. In January 2017 US regulators claimed that Qualcomm had forced Apple to exclusively use its products in return for lower fees. Details of the alleged deal were listed by the competition watchdog, the Federal Trade Commission, as part of a lawsuit against the chipmaker. The company denied the allegations saying the case was “flawed”. The commission sued Qualcomm for unfair practices in the way it licenses its technology – especially the processors used in cell phones and other devices. Last November the company rejected a $103bn (£79bn) takeover bid from rival Broadcom. Is nationalisation the answer for Britain's railways?